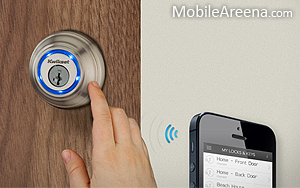 The World is going fast with the advent of new technology and now you can control the locks of your house with your smatphone and this story is about development in this technology. Way back in the year 2011 Phil Dumas’ company UniKey Technologies debuted its product on Shark Tank. It was a lock that used your smartphone as a key. Disruption! At the time smart locks were not really a thing yet UniKey plowed yet as the market exploded with similar products. Now, five years after its primetime debut, UniKey is announcing an oversubscribed Series A to charge forward amid serious competition. Participating round includes Asset Management Ventures, AXCIT, Broadway Angels, CBRE, ff Venture Capital, Samsung, Haas Portman, Oriza Ventures and other global investors. The company previously raised 2900000 US Dollars in venture funding. “We’ve pioneered the smart lock category for the residential market five years ago and now UniKey leads the market with the most convenient and secure access solution for businesses and consumers worldwide,” said Phil Dumas in a released statement today. According to Dumas the additional funding will help the company expand internationally and bring the company’s technology to new markets outside of the smart home market. The company managed to net a deal with Kwikset that put the UniKey technology in a Kwikset product. Since UniKey launched its first product, countless smartkey products hit the market. There are smart lock startups like "Lockitron" and "August" and offerings from major home hardware companies as Schlage and Kiwkset (which also sells products not powered by Unikey). Yet the market is huge. Every house, apartment and business has a lock that could use a technology upgrade.